The scone is something which I haven’t baked since school (many moons ago). The inspiration came from a tea room at a farm near Loughborough, in which I had a warm buttery cheese scone – delicious! The art of scones is apparently not overworking the dough. Some even say that you shouldn’t even roll out the dough with a pin but use your hands to gently flatten, a technique I decided to follow – if it is good enough for Delia it is good enough for me! My internet research provided a large variety of recipes. I decided upon the BBC Food one, with plain simple ingredients. I can’t seem to come to terms with raising agents being used when we can make the same light texture with careful hands…but that is an argument for another day! 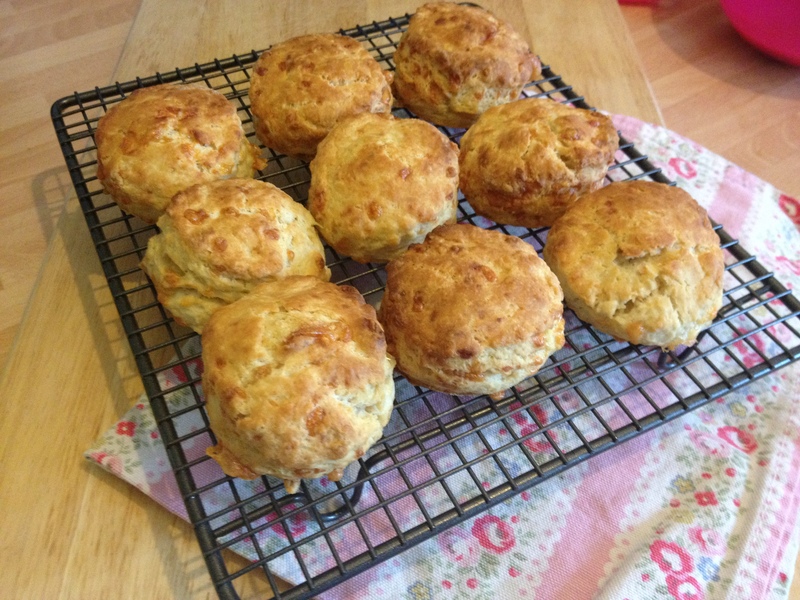 The scones were easy and quick to make and the results were very pleasing – light and delicious! I think the addition of herbs (maybe thyme or oregano), sun-dried tomatoes or just different cheeses would make a tasty alternative to this classic cheese scone recipe. It is definitely one that has joined my collection!